71 only..sorry but in 72 they were stripes running down both sides of an air grabber car...Been seen on flat hood Sattys as well..
St Louis Built 72 RR with V21 V25 both coded on the tag..
Bottom tag is the latest GTX...72 AS WELL..
Last edited by 72N96RR; 01/04/12 12:17 AM. Here is a picture of my 72 with the V21 code. Orange... (color keyed grille and chrome mirrors???) Lower grill is orange is this the blower car? 73 Bumper ? Last edited by UCUDANT; 08/28/12 08:05 AM. I know that there are differing opinions as to the correct organisol finish. 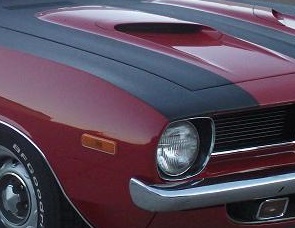 A 71 Hemi Cuda with just 2,010 original miles is for sale currently. The paint and body are claimed to be all original. Here is a shot of it's tail panel organisol finish. The emblems might help provide scale reference to the texture. Is the blueprint for V21 1969 Road Runner available? 6T9_CHARGER_RT posted the factory engineering diagram above. Here's a 72 Satellite Sebring plus with the V21/V25 hood and trunk tape stripes. Sorry for the small photo, it's from a car show about 20 years ago. I remember talking to the owner who said he bought it new and the car did look untouched. Here's a dealer book page on the 72 stripes and the V21/V25 was available on any 2 door, only with the Air Grabber on the RM23 cars. There is a lot of conversation of what orig organisol looks like...just remember organisol paint wears [easily] over time-this is not conjecture but from working with it for 35 years. A couple of yrs ago I painted a Charger hood with real nos organisol. After 2 yrs of limited driving, a few washes and more than several swipes with a feather duster it is already changing from it's original texture. The only thing you can do to stop the wear is to put the car away in a hermetically sealed container and never touch the surface.